South Bend, Indiana - President and Mrs. Carter have accepted an invitation from Andrew Berlin, owner of the South Bend Cubs, to enjoy a game at Four Winds Field in the Owner's Suite this Wednesday evening. 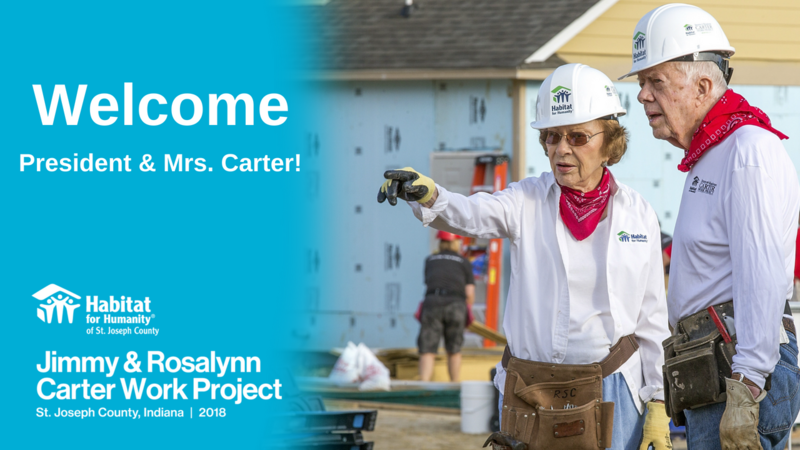 The Carters are in town as volunteers for the 2018 Carter Work Project which is building 41 Habitat for Humanity homes in St. Joseph County. 23 of the homes are being built in one Mishawaka, Indiana neighborhood by hundreds of volunteers this week. "This is a great honor," said Andrew T. Berlin, Owner of the South Bend Cubs. "President Carter has done more in his post-presidency to help other people across the country and around the world than any other President in United States history. A relaxing evening in the Owner's Suite at Four Winds Field is our humble way of thanking him for bringing the 2018 Carter Work Project to this community." "I'm happy we can do this for the President and First Lady," added Joe Hart, President of the South Bend Cubs. "They are an amazing couple with close ties to this community. Our hope is that fans come from fifty miles around to help us thank them for bringing the Carter Work Project here." Wednesday's game against the Bowling Green Hot Rods starts at 7:05 p.m. Gates open to the public at 6 p.m.
Tickets can be purchased online or by calling the Box Office at 574-235-9988. As a reminder, the gates open two hours prior to the first pitch for all Friday, Saturday and Sunday games throughout the season. The 1st Source Bank Performance Center will be open during home games for all ticket holders. The South Bend Cubs are the Class A minor league affiliate of the World Series Champion Chicago Cubs. Over the past 29 seasons, the team has won five Midwest League titles, most recently in 2005, and has captured 12 division titles. In 2015 the team was named Ballpark Digest's Team of the Year and received the John H. Johnson President's Award, the highest award in minor league baseball. The team is owned and operated by Swing-Batter-Swing, LLC whose shareholder is Andrew T. Berlin of Chicago, Ill.